Ok, ok, I promised a post on Friday but after we got home form NH I woke up sicker than a dog (sorry for the pun Winston) on Friday and spent most of the day in bed. On to Winston. I met Winston at the Franklin Falls Dam for the first time last Sunday the 23rd. The weather had been horrible all day and the fog was thinker than in London. Winston was at the dam with his Mom and Dad as well as one of those balls that comes with a flinger. He bounded up to say hi and then just turned into a full grown playful puppy. The pictures didn't come out great but I got lucky when I ran into him 2 days later at the dam. Dad forgot to bring his tennis ball but Winston still wanted to mug for the camera. 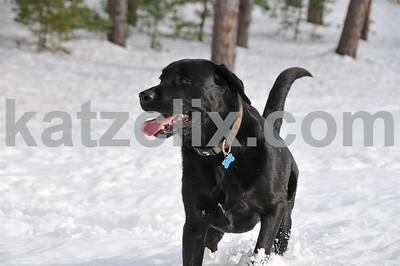 We discovered that he loved to chase snowballs too. 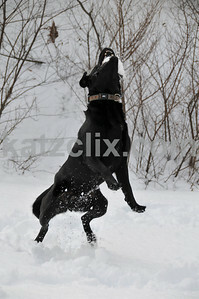 He bounded into the snow and looked just like a hunting dog watching the snowball leave Dad's hand. He waited, timed his jump and caught everyone except for the one that was thrown too far. Didn't stop him from trying though. I am sure that next time we visit NH we will run into Winston again and maybe we will bring Doogie along for him to play with. It's a dog, dog world!